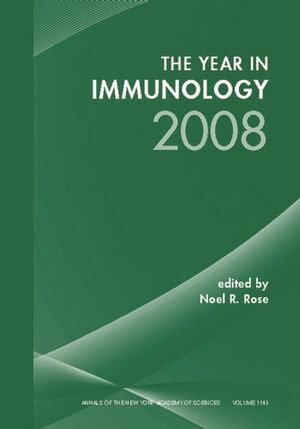 This volume highlights the latest information and newest understanding in immunology. It encompasses both basic research and clinical applications of the latest immunologic knowledge. Noel R. Rose, MD, PhD, is a Professor of Pathology and of Molecular Microbiology and Immunology at Johns Hopkins University. He is also the Director for the Center for Autoimmune Disease Research at the university. 1. TLR and TLR Signaling: Taro Kawai and Shizuo Akira. 2. TLR in Autoimmunity: Maria Fischer and Marc Ehlers. 3. CARD9 Signaling in the Innate Immune Response: Jürgen Ruland. 4. β-Glucans and Dectin-1: S. Vicky Tsoni and Gordon D. Brown. 5. Basic and Clinical Immunology of Siglecs: Stephen von Gunten and Bruce S. Bochner. 6. Mast Cells: Multifaceted Immune Cells with Diverse Roles in Health and Disease: Kavitha N. Rao and Melissa A. Brown. 7. The Thymus Medulla Slowly Yields Its Secrets: Lars-Oliver Tykocinski, Anna Sinemus, and Bruno Kyewski. 8. RANK/RANKL: Regulators of Immune Response and Bone Physiology: Andreas Leibbrandt and Josef M. Penninger. 9. Functional Analysis of FOXP3: Jane H. Buckner and Steven F. Ziegler. 10. Retinoic Acid in the Immune System: Karina Pino-Lagos, Micah J. Benson, and Randolph J. Noelle. 11. Regulation and Function of Proinflammatory TH17 Cells: Gustavo J. Martinez, Roza I. Nurieva, Xuexian O. Yang, and Chen Dong. 12. Recalling the Year in Memory T Cells: Nicholas D. Bushard and Donna L. Farber. 13. MicroRNAs and Their Emerging Roles in Immunology: Kaleb M. Pauley and Edward K. L. Cha. 14. Immunology of Mercury: Jaya Vas and Marc Monestier. 15. Anti-CCP Antibody: A Marker for the Early Detection of Rheumatoid Arthritis: Walter J. van Venrooij, Joyce J. B. C. van Beers, and Ger J. M. Pruijn.